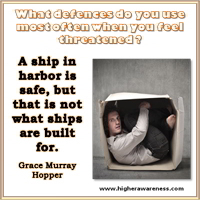 What defences do you use most often when you feel threatened? When we were young, we adopted defensive measures to protect ourselves from being hurt. Those old and usually unconscious patterns for protecting ourselves may now be interfering with our ability to fully and genuinely engage with life. Visit our site to see a list of defence mechanisms. Once you identify how you typically defend yourself, be alert to when they show up. Be aware of when (and why) you use those defences. How do they interfere with your ability to be fully present in your relationship? Awareness is usually all that’s needed to give us the space to choose to respond differently.